The S.F. streets have literally been flooded with star sightings as of late — from Natalie Portman and Kanye West to Joe Zee and Frances McDormand, it’s been a packed month for celeb appearances in the Bay. Well, we can add another looker to the ever-expanding roster of A-list city visitors. 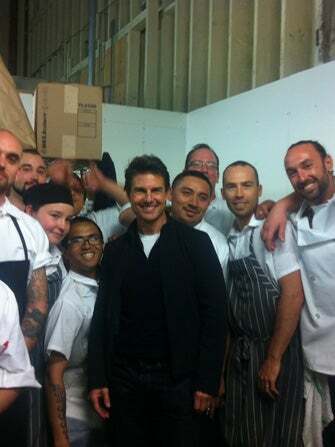 An anonymous tipster spills the beans about none other than Tom Cruise’s visit to Waiheke Island Yacht Club at Pier 29 on Saturday. Apparently, the actor was in town dining with Warner Bros. execs and discussing a potential movie to be filmed in New Zealand, which just happens to be the theme of the fare served up at Waiheke. Cruise chowed on Moa Pale Ales, and a tasting menu that offered Leigh Snapper ceviche, Silver Fern Farms Silere Merino Lamb, and Coconut Fromage dessert — what a mouthful. We also hear Cruise was nothing but a gem, proving that even posing for a few pics with the staff was no mission impossible.